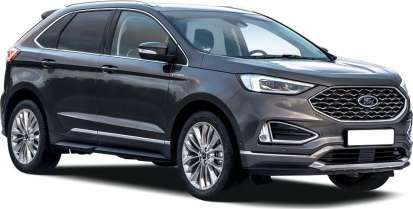 Compare brand new Ford Edge Vignale Diesel Estate lease deals! All Edge Vignale Diesel Estate deals include delivery, road tax and a full manufacturer’s warranty. We collect the best Ford leasing pricing from across the industry, saving you time and money. Select a trim below to get started. Which Ford Edge Vignale Diesel Estate Trim Should I Choose? In my time as a motoring writer, I've driven quite a number of Ford models that were originally developed for the American market and haven't really translated very well for European buyers. Here's an exception though, the Ford Edge luxury SUV, the latest addition to our long term test fleet. This car instead shares its CD4 platform - and much of its interior - with the well-regarded Mondeo, as well as Ford's S-MAX and Galaxy MPVs. That People Carrying provenance is one reason why the Edge is so spacious inside, as my family have been finding out over the last few weeks. Curiously, for the European market at least, Ford hasn't used that extra room to build in the third seating row that many family SUV buyers now seem to want. Still, the lack of that feature doesn't seem to have held back some of the much more compact mainstream-brand models in this segment that this Ford has been priced against, contenders like Renault's Koleos and plush 4x4 versions of Volkswagen's Tiguan and Honda's CR-V. The idea here is that for the cost of something like that, an Edge can give you the kind of space inside you'd expect from a much larger and pricier luxury SUV like a Volkswagen Touareg or a BMW X5. Which has to be a strong selling point. But does this car have others? We're going to be finding out over the next few thousand miles. You can only have a 2.0-litre TDCi diesel powering your Edge and you have to have it with Ford's Intelligent All-Wheel Drive system, 2WD being an option the company doesn't think is really relevant on an SUV of this size. Buyers choose between two mechanical set-ups; a 180PS single turbo variant you have to have with a 6-speed manual gearbox; or the package we're trying, a 210PS twin turbo derivative only offered with 6-speed PowerShift automatic transmission. The 210PS engine's extra turbo gives you 50Nm more pulling power, which we've found makes a noticeable difference when you're overtaking, especially if you snick the auto selector down into its sportier 'S' setting. Unfortunately though, the extra torque isn't enough to improve this car's 2.2-tonne braking towing limit - that a rather disappointingly low figure when you consider that US-market Edge models can apparently lug along up to 3.5-tonnes. Here you can view the pricing history for the Ford Edge Vignale Diesel Estate on LeaseFetcher. What is the fastest Edge Vignale Diesel Estate option? The Edge Vignale Diesel Estate 2.0 EcoBlue 238 5dr Auto is the fastest trim. It will go from 0-62mph in just 9.6ss and has a top speed of 134mph. What is the most fuel efficient Edge Vignale Diesel Estate option? The Edge Vignale Diesel Estate 2.0 EcoBlue 238 5dr Auto is the most fuel efficient trim. In urban environments, it will achieve 32.5mpg and on the highway it will achieve 47.9mpg . Its combined fuel efficiency is 40.9mpg. What is the most eco-friendly Edge Vignale Diesel Estate option? The Edge Vignale Diesel Estate 2.0 EcoBlue 238 5dr Auto is the most eco-friendly. It emits just 180g/km of CO2. What is the cheapest Edge Vignale Diesel Estate option? The Edge Vignale Diesel Estate is the cheapest to lease. It costs just £500.48 per month with an initial payment of £6,005.76. That's for a 4 year deal with 8,000 miles.